The print pictured above is by graphic designer Vahram Muratyan who recently produced a series of adorable images that asks the question, Which is better, Paris or New York? By comparing two similar images, one stereotypically Parisian, the other classic New York, the viewer is asked to take sides. Now, before I give you my opinion on the age old macaron versus cupcake battle, I should probably first make a SHOCKING confession. You may want to sit down for this. Oh, wait, you probably are sitting down. Okay, here it goes… I’ve never actually eaten a macaron! I know! It’s pretty pathetic. Food sites have been filled with these babies for the last few years, but I have yet to sample one. So, as much as I like voting, I think I’ll have to abstain this time. It wouldn’t be right to cast my ballot when I don’t have all the information, but I'd love the hear your opinion! If you want to check out Vahram's Paris vs. New York blog, click here. 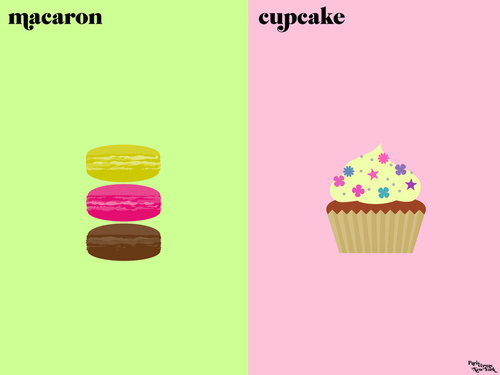 If you're interested in picking up a Macaron/Cupcake print for your home, click here to check out Vahram’s Paris vs. New York prints ($24 each). I don't think you are pathetic for never eating a macaron, because I have never eaten one either! Nope. I think macarons look cute and are great when decorating dessert tables, but honestly, I highly doubt they are as good as cupcakes. Basically because macarons have two crispy "shells", which doesn't seem like it would be as creamy and palate-pleasing as some good ole icing! Macarons remind me of those wafers you get in gas stations. I vote cupcake! Thanks, Jessica! Funnily enough, I just had a macaron...for the first time! My mom was in San Francisco and I asked her to pick me up some macarons from Miette. I've had two so far and I have to say, I think I love macarons! They weren't as crispy as I thought they would be. I don't know if that's because Miette makes them a little differently or if they softened up a bit while travelling. Anyway, they are small, but they have a lot of flavor. I *think* I might like them more than cupcakes! But that might just be the newness of the thing. That feeling may wear off later.